Time is running out for our survey and we really need your help. Registered members are eligible to win up to USD120 in prizes, for two minutes of your time. Nikon remains bullish on profit projections after senior officers revealed the latest three-year operating plan. Most notable is the projection on profits rising from 53B Yen to 90B Yen (USD764M), an increase of about 70 percent over the course of the fiscal year. That projection will be driven by digital SLR camera sales, which represents over half of the company's current profit portfolio. The outlook also remains optimistic on the sales of stepper tools and other chip-making equipment. Nikon President Michio Kariya was also quite confident of the company's performance despite the entry of Sony and other electronic consumer firms into the DSLR fray, stating "We will leverage to the maximum the know-how accumulated during our more than 50 years in the camera business." Nikon trails only Canon in the heavily contested market. The plan's success also banks upon slightly higher sales of stepper and chip-making devices. Compared to the calculated increase of 2.7M units of DSLRs (up from 1.7M), Nikon expects to sell 165 stepper units, up from last year's goal of 160. Yet stepper machines make up approximately 45 percent of the company's profit table. Kariya also promised to reduce Nikon's debt, currently at 195M Yen, equal to shareholder equity. No details were forthcoming, but the debt would be eased by cash flow, not asset sales. Kariya also indicated he would consider acquisition of firms that would complement the maker's overall strategies. Clearly part of that strategy is to cut costs and find more efficient means of producing quality items. This may include silent outsourcing of components or even whole products. As noted in Digitimes, Taiwan outsourcing manufacturer Asia Optical has reputedly taken orders from both Nikon and Fujifilm. No details are forthcoming on the order, but Asia Optical has stated that they will avoid orders for low-end or low-priced models so as to prevent being caught in the margins of the price wars that categorize the entry-level digicam market. Download The Image Doctors for March 30, 2006: NPC-ID-2006-03-30.mp3 (29:07, 13.8 MB, mp3 format). We suggest checking out the Lightsphere and heading towards the Wedding Forums. Reader Alert: Look for a special "unscheduled" episode in the not too distant future! As whistleblowing incidents go, this one sounds intriguing. Kodak fires their Director of Engineering after she objected to a company initiative that would "implement an aggressive cost saving project by illegally tampering with customers cherished digital photos." It's unclear exactly what the tampering specifics were, but this one should be an interesting case to follow. Following the story's break on PRNewswire, the EETimes now reports that the manipulation apparently involved compressing customer photo files stored in Kodak's online Galleries without the owner's consent. Kodak would not comment on "personnel issues" but stated that Raber's accusations "are completely false." Are you looking for Nikonians merchandise? Look no further than our Cafepress page stocked with great branded items like our Max DOF t-shirt; complete with a hyperfocal table mounted upside down for the photographer's convenience. We also have coffe cups, messenger bags, hats, journals, tote bags, magnets and more! Everything you need to be the well-dressed and equipped Nikonian. The folks at digitalcamerainfo.com have posted an interesting head-to-head comparison of the Nikon D200 vs. the Canon EOS 5D authored by by Alex Burack and Patrick Singleton. The authors make a compelling argument for choosing to match the D200, which retails at roughly half the price, against the Canon EOS 5D. This in-depth comparison draws interesting conclusions from the authors and is an informative piece for both Nikon and Canon fans. Nikonians have been discussing the Canon EOS 5D for months. Staunch loyal supporters of one brand over the other may find some of the observations and conclusions worthy of igniting controversy, but both camps should remember the basics in camera comparisons. This is not just a question of which camera is better. This is a question of which camera is best suited for your needs, your budget, and your current inventory of compatible lenses and accessories. In that regard, it is fair to say the D200, at half the price, did very well indeed. JRP and I never thought Nikonians would grow at this rate as we started the community back in April 2000. What took off as a hobby has become a site with over a million visitors per month, a community being a very important part in our lives, affecting many others as well. Today we crossed the 40,000 member mark and with the current growth, the community will be 50,000 members strong this summer. With all the interaction in over 60 forums, we are very lucky to have a dedicated team helping out around the clock with moderating, creating content and much, much more. You gals and boys on the team are the core of Nikonians and together with our large number of regular members, supporting us in all kinds of ways, you are carrying the Nikonian spirit high. We are very proud to be able to say that our community is a friendly and helpful island in the vast ocean of the Internet. Thanks to all of you on board for making these first six years such an exceptional, rich, deep experience. P.S. For those of you who hadn't the chance to meet us at the PMA, Nikonians exhibits at the Photokina, Cologne, Germany this year. You are most welcome to visit for a chat. Nikonians is conducting a survey with one of our main sponsors, Pelikan Hardcopy, and we need your help! Pelikan is interested in hearing your opinions on printing and paper use in the course of your photography. The survey will take only two minutes and we are offering prizes valued up to USD120! To participate, you need to be a registered member of Nikonians and provide a valid e-mail (please note: the e-mail will only be used to contact prize-winners; they will be anonymized for purposes of the survey). This survey is only running for two weeks, so enter now! The Segment # 1 Winners in the 2006 Nikonians Photographer of the Year have been selected and these photos are certainly worthy of the honor. From Geoff Peterson's foggy and placid view of the forests to a waxing Moon by Louis Blair, these photos represent the best in skill and artistry that comprise the Nikonians community. All first place winners received a copy of Bibble Pro RAW editing software courtesy of Bibble Labs and move forward to the finals. All second place winners received a Tamrac 9 Velocity Sling Bag courtesy of Tamrac. Click here to learn more about our contests. Tokyo, Japan. Photo Imaging Expo (PIE) 2006 starts today. Since last year, it is now a joint event of the four leading sector associations in Japan : the Camera & Imaging Products Association (CIPA), The Photo-Sensitized Materials Manufacturers' Association (PMMA), the Japan Color-Photo Finishers' Association (JCFA) and the Japan Photo & Video Accessory Association (JPV). The Photo Imaging Expo is one of the most important imaging trade fairs in Asia and it may even bring some new announcements; newer than those made at the Photo Marketing Association (PMA) 2006 show last February. Nikonians will therefore keep a close watch. Nikon is making a last call for entries in the 32nd Annual Small World competition. Amateur and professional microscopists have until April 28th to submit their images either digitally or on film to Nikon's Melville NY headquarters. Winners will be announced mid-summer. Finding camera reviews and photography information on the Web is now easier for those who prefer the Nikon brand. The Nikonians new search engine dubbed NikoScope has been quietly weathering beta-tests with the help of the 40,000-member online community, which has been gathering news, articles, reviews, and lively forum discussions for the past six years. As Nikonians.org grew in membership the free information available at the site expanded to a large resource library covering a wide range of photography topics surrounding the Nikon brand. "Keeping up with that much information required an internal upgrade to the site's search engine" says Nikonians co-founder Bo Stahlbrandt. "We have over 400,000 pages of Nikon related content on our site alone, and our members wanted access to that, as well as the rest of the Web, all from one portal," he said. "The result is NikoScope, a fast search engine built on modern technology, designed to gather and sort not only our published information, but also the relevant resources of the Internet." Stahlbrandt describes NikoScope as a high-tech search engine with a custom touch that requires hand selection of relevant material. "We opted for manually selecting the sites we are spidering, not just letting anyone get listed. Instead of getting over 10,000 or more results on a search for a specific camera, you will get significantly less, maybe only a 100 hits," he said. "But the difference is those results are more likely to have relevant information about that camera, not just mere mentions of it. The Nikonians community is very vertical and our success and strong traffic is based upon it. I expect we will see a similar, strong growth for NikoScope"
The NikoScope index is updated several times per week with hand picked, quality websites and resources for photography and imaging. Designed for use by average photography consumers as well as professionals, the search engine, like the community of Nikonians who developed it, leans specifically to Nikon related information. On the heels of the 18-200 VR review, the much awaited look by Thom Hogan on Nikon's latest offering is now up. Does he love it? " Was the wait for the D200 worth it? Absolutely yes." One-half of Thom Hogan's much awaited reviews has been posted - the 18-200 is scrutinized - "Superzooms shouldn't be this good..."
Nikon's projections for 2007 include a 30% rise in digital SLR shipments , but sees a fight for the heavily-contested entry-level market. Managing Director Makoto Kimura sees revisions neccessary in marketing and selling entry-level models under USD1000, but is betting on significant growth to help boost revenue. This same competitive market segment cost Konica-Minolta and Kyocera their place in the imaging industry. Nikon has already made sizable increases in their imaging division, with a 28 percent boost in R&D to 13.2B Yen ending in March of 2005. Overall, camera R&D represented over 40% of the company's overall research expenses. Kimura acknowledges that the lifecycle of a typical DSLR has dropped to about 1.5 years versus 3 for an equivalent film model, so turnover is expected to fuel part of the coming wave of growth. Nikon has already implemented many cost-savings in order to remain competitive, having consolidated manufacturing lines to two plants; one in Thailand for consumer models and the other in Japan for pro versions. In addition, camera models now share a wide common base of parts and Nikon has increased parts procurement to achieve further cost-savings. Nikonians is the worldwide home for Nikon photographers. With over 30,000 members and 40,000 visitors daily, we are the premier photographic community. Want to know more? Take our Guided Tour! Sony has released an update to their 5GB Compact Vault drive. The new version sports 8GB, and like it's predecessor, is a Compact Flash Type II hard-drive card suitable for use in many popular digital still and video cameras. Equipped with Sony's "CyberCapture" optimization firmware and capable of 96/MB maximum throughput, it has the capacity to hold up to 2500 3MB JPEG files or 4 hours of MPEG-4 footage. Initial availability is scheduled for June 2006 with an MSRP of USD259.99. For our members across the Atlantic, Sigma UK is offering a "try before you buy" option through the Cameraworld retail chain. 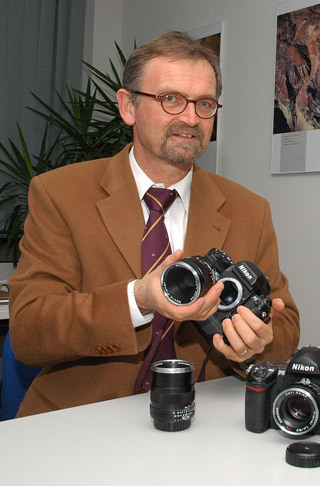 Carl Zeiss has announced that starting April 2006, the Camera Lens Division will take full responsibility for global distribution of it's product line, including ZM Leica mount and the recently announced ZF Nikon mount optics. Leveraging previously existing retailers and locations, Zeiss will focus on key areas in Europe, North America and Asia. The company will also open an online retail presence at https://www.zeiss.com/photo starting April 3rd. For our members who own the new 18-200 VR DX, there are two service advisories currently circulating regarding it's compatibility. Fujifilm has issued a technical notice indicating a partial incompatibility with the AF system on the S2 and S3 Pro models at close-focus distances while using the 18-200. Specifically, with the lens set at wide focal length and focus point set to infinity, the camera may fail to focus at close-up subjects. A fix is required for all users of the aforementioned cameras who intend to use this Nikkor lens model. There is no charge for the upgrade as long as ownership of the 18-200 lens can be provided. Nikon has issued it's own notice which has similar symptoms, but the incident could occur with the D70, D2H and D100. The good news is that D70 owners running Firmware 2.00 need not worry. D2H owners will have to wait for a firmware fix due in late March/early April of 2006, and D100 owners will have to send in the camera for updates. 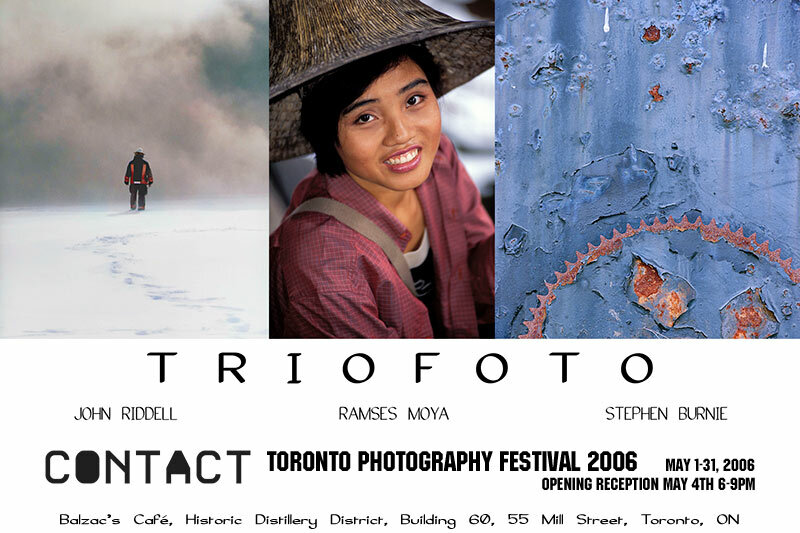 We are pleased to announce that there will be three well-known Nikonians displaying their best work at Contact 2006, the premier North American Photography Festival now celebrating it's 10th Anniversary. Nikonians John Riddell (Newsphotog), Ramses Moya (ramsesm) and Stephen Burnie (F80), collectively known as TRIOFOTO, will have a gallery showing of their photos for the entire month of May at Balzac's Cafe in Toronto's historic Distillery District. If you're planning to be in the area during that time, be sure to stop in and view their work! Download The Image Doctors for March 16, 2006: NPC-ID-2006-03-16.mp3 (35:53, 16.9 MB, mp3 format). Reader Mail; Understanding Hyperfocal distance. For our members using Sigma's EM-140 Flashgun, a new firmware update has been announced that will ensure compatibility with D2X, D2H, D2Hs and D200 models. The US Olympus subsidiary is issuing a recall on 1.2 million cameras because of a potential for overheating flash circuits. The recall affects cameras made between 1989 and 1995, and includes models such as the Infinity Twin, AF-1 Twin, Infinity Zoom 200 series, AZ 200 series, and Quantary Infinity Zoom 222 Olympus-brand. We are going to start an additional podcast service, approx 8-10 minutes per episode published twice a week. The podcast will contain the latest in the community, what is hot in the forums and news from the blog. Best if you include a short audio recording as MP3 file. We will help you with the production of this Nikonians podcast and it will be published through our channels reaching out to many thousands of listeners. Letsgodigital has put up their Nikon D200 review, and they're very impressed. Summing up all of the above, we can conclude that Nikon has caused an earthquake in the current d-SLR market with the arrival of the Nikon D200. A camera of this excellence with such a staggering amount of functions and outstanding image quality, in combination with its price-tag, is truly unheard of. In case you have missed it, our hands-on micro review on the 105mm f/2.8G IF ED AF-S VR Micro Nikkor is up. Worldwide photography community appoints Chief Editor for original content creation with a focus on educational material. Nikonians, a worldwide community for Nikon photographers and enthusiasts, appoints Tom Bone as Chief Editor. Bone will be coordinating Nikonians original content creation efforts for the community's expanding readership, which includes imaging professionals as well as advanced photo amateurs. His background in photojournalism spans more than 35 years, starting with his first Nikon camera in 1969. He has been an active team member in the community since April 2002. "We are truly grateful to have a member with the news media background of Tom join our content and publishing team," says J. Ramon Palacios, one of the community's two founders. "We have seen strong content growth throughout 2005 and Tom's focus on educational and learning content reflects our readers and the industry's increased demand for high quality content." Nikonians targets the needs of both ambitious photographers and imaging professionals. With a rich variety of content products such as articles, tips & tricks, guides, eZines, ebooks, podcasts and newsletters, Nikonians is well positioned for further strong growth. The quality resources and friendly atmosphere, combined with strong visitor, membership, and page traffic growth have made Nikonians.org an ideal place for companies to present educational content, highly focusing their messages while gaining further brand-recognition. The OpenRAW initiative started a RAW survey on January 31st, 2006 about experiences, requirements, preferences and concerns regarding RAW imaging technology. As strong supporters of open RAW documentation standards, we encourage you to spend just 10 minutes to fill out the survey - even if you might not agree with OpenRAW or don't shoot RAW. This is the last chance, the survey is scheduled to close March 15th, 2006 24:00:00 GMT. Nikon in cooperation with Popular Photography presents famed photographers Rosanne Pennella, Joe Buissink and Vincent Versace in one-day, hands-on master classes. Learn how to use the latest Nikon digital products to master your best travel, wedding and nature shots. The Nikonians PhotoProShop.com ships daily Mon-Fri both out of Philadelphia and in Europe using FedEx. PhotoProShop was launched back in January 2004 and meanwhile it has served several thousand ambitious photographers and imaging professionals. We carry Kirk and Markins camera support equipment. Gitzo Mountaineer tripods are going to be available end of March. We have a fourteen days return policy. Images from the D200 rival those from the D2x in resolution, color accuracy, and overall image quality. Pop Photo has also posted a News Podcast and updated images on the same page. Nikon UK press release: Nikon has teamed up with the London Wetland Centre to offer an exciting weekend of activities for budding photographers. On Saturday 13 and Sunday 14 May the centre in Barnes will be hosting a Wildlife Photography Weekend. Visitors to the centre will be given the opportunity to see and try the latest Nikon equipment and receive advice from Nikon experts. Wildlife photographer Chris Packham will be at the centre for the whole weekend, leading a programme of wildlife walks and lectures. There will also be the chance to attend sessions led by a Nikon trainer on composition of photographs. For those wanting to learn about digiscoping, the art of taking photographs with a telescope and digital camera, there will be a number of small workshops which will provide an introduction. On Sunday 14 May the centre will also be running its 6th annual Big Bird Race. Each year a trophy and prize is awarded to the birdwatcher who manages to record the highest number species of birds before 3.30pm in the afternoon. Bird experts will be on site to verify results. All talks and walks are included in the price of entry to the centre and booking in advance is essential. For more information please call the London Wetland Centre on 020 8409 4400. * The London Wetland Centre is open 7 days a week (except for 25th December) from 9.30am to 6pm (last admissions 5pm) in summer, 9.30am to 5pm (last admissions 4pm) in winter. * Located in the heart of our capital city, the centre attracts more than 170 different bird species annually, some of which such as Gadwall and Shoveler are present in nationally important numbers (leading to the site being designated a SSSI or Site of Special Scientific Interest). An increasing variety also breed at the centre, including Lapwing (a bird that has seen a 50% decline in numbers in the last decade alone), Reed and Sedge Warbler, Little-ringed Plover and Pochard. Recent rarities that have dropped in to the reserve include Cattle Egret, Goshawk, Marsh Warbler and Curlew Sandpiper. * The Wildfowl & Wetlands Trust is the largest international wetland conservation charity in the UK. WWT's mission is to conserve wetlands and their biodiversity; these are vitally important for the quality and maintenance of all life. WWT operates nine visitor centres in the UK, bringing people closer to wildlife. This year the trust is celebrating its 60th birthday. So You Want To Be a Tabloid Photo Editor? PDN Online has a great article giving an inside look on the photo editing process at a tabloid/celebrity magazine. Join the photo editors at US Weekly as they process through thousands of stills to get to the final state of their Oscars Awards edition. Letsgodigital reports that TDK has pulled out of the recordable CD and DVD market. The company will continue to be a third-party supplier of such products and will participate in the strengthening Blue Ray disc segment. In response to member requests and developing trends, we've created three new forums. First up - Photographers Wanted, where our premium members can post offers for assistants and internships. Based on the success of our 'Podcasts, we've also build a Podcasts Feedback forum, where we want to hear your input about our latest multimedia offering. And finally, we've broken out a dedicated forum to talk about Black & White photos, irregardless of whether they're film or digital. As per earlier reports, Nikon Corporation has ceased it's relationship with Anam Optics and has established a wholly owned subsidiary in South Korea. Nikon will open a full-service center in Seoul on March 13th and will have full operations in swing by April 3rd. Despite previous reports of parts shortages during the transition, Nikon aims to strengthen it's position and become one of the top three sellers in this nation. We are looking for your feedback on how to further improve our NikoScope.com search engine. So, please visit the Nikonians Cafe and let us know. The voting is over and the winner of the 2006 Nikon Coolpix Pride and Joy Baby Photo contest has been chosen. Kate Okerstrom of California has been named the winner, and she is quite photogenic ! Kate receives a USD25000 Savings Bond and an appearance in an upcoming Nikon advertisement to be shown in Life Magazine. Congratulations to the Okerstrom family! We note with sadness the passing of famed photojournalist and film maker Gordon Parks at the age of 93. His reputation as photographer including his extensive work for LIFE magazine earned him honors from camera manufacturers including Kodak and Nikon-- and his multi-talented ability to use the visual media (still and motion) will be his everlasting legacy. Nikonians in the Color Slide and Print Film forum have been discussing Fujifilm's shift from the internationally hailed favorite Fujichrome Velvia 50 to the new 100 ISO versions. While some have made favorable comparisons, today's announcement by Fujifilm UK should serve as a final notice for those who want to stock up on the last batch. By the way, Fujufilm was not too happy with reports that they were dropping out of the film business. There are some images of the Nikonians team, members and visitors that attended this years PMA in our galleries. Nikon's expanding line of Coolpix cameras adds the S6 with wiFi capability. The folks at Digitalcamerainfo.com have weighed in with their first impressions. When you get yours, don't forget to drop in to our Coolpix Forum and share your thoughts and opinions. Micron has announced today that they will purchase Lexar in a stock-for-stock trade, pending regulatory approval. The move marks yet another notch in the consolidation trend sweeping the memory maker market. Based on the press release, Micron will leverage their flash memory manufacturing prowess with Lexar's brand superiority in systems and controllers to create a unique product line aimed at serving both the solid-state and growing mobile handset segments. The newly released 105mm f/2.8G IF AF-S VR Micro Nikkor caught the eye of our Nikonian contingent at the recent Photo Marketing Association (PMA) International Show in Orlando. For a quick review by founding member JRP (still unpacking from his extended whirlwind tour of the U.S), check our Resources Page. Member Vishal Sabharwal (shal) has shared interesting links since joining Nikonians last November. His most recent find leads to a Lexar Tips and Lessons page that is brimming with digital photography guides. If you are new to Nikonians, don't forget we have our own collection of Guides, How-to's and Tips and Tricks in our Resources section. Following the very successful first tour, Claus Brandt is now taking registrations for his Helgoland 2007 Workshop. Join our award-winning colleague as he takes you to some of the most beautiful spots in Northern Europe for wildlife and scenic photography. The tour is limited to eight slots, so sign up today! The Korea Times reports that consumers are angered by the ill-prepared nature of Nikon's service centers in that nation. A shortage of parts has plagued the transition as Nikon ends it's relationship with local provider Anam and seeks to establish it's own chain of repair depots nationally. We still have openings left in our workshops in beautiful San Francisco, California for Nikon Capture and Adobe Photoshop! Also a brief reminder to our Phoenix, Arizona participants - we've moved the workshops from April to June to accomodate the Easter schedule. Letsgodigital has an interview conducted at PMA 2006 with Sigma Chief Operating Officer Kazuto Yamaki. Yamaki comments on the latest developments with the newest 70-200 Macro, the future of Four-Thirds and continuing use of Optical Stabilization (OS). Award-winning Nikonians Member Claus Brandt is leading a Wildlife photography workshop to South Africa's Kruger National Park this summer from June 17th through the 25th. Space is going fast, so be sure to sign up! PDN Online reports on proposed US Senate legislation that would make it easier for people to reuse "orphaned" works - such as photos whose creators are dead, forgotten or difficult to contact - without fear of liability. This is causing much concern for many trade associations and groups who see this as yet another attack on existing copyright law. PDN has extended the deadline for entries to the 22nd Annual Self-Promotion Awards. The contest is co-sponsored by Nikon and seeks to recognize the best in self-promotion pieces and materials available. The deadline is 5/24/2006, and winners will be featured in PDN's October Issue and a web gallery will be made available at PDNOnline. Fujifilm USA has lowered the price of the S3 Pro to USD1699. This price includes the AC adaptor and the HS-V2 Hyper Utility RAW converter. Both items were previously optional. While this may be a sign of an impending S4, it may also be repositioning by FujiFilm to make the product more competitive. Epson introduced today two new 6400 dpi scanners: the V700 Photo and V750M Pro. The scanners feature Dual Lens System that enables the new scanning resolution. The scanners can accomodate 35mm, 2 1/4, and 4x5 formats and can effortlessly switch to the standard 4800 dpi as needed. The Pro version also features a fluid mount to allow wet scans of media, which is especially useful for B&w film. Both scanners will come bundled with Lasersoft Imaging Silverfast Ai 6, Adobe Photoshop Elements, ABBYY FineReader Sprint Plus OCR, Epson Scan and Epson Copy. In addition, the Pro version will come exclusively with MonacoEZColor. The Photo version will be available in March for an estimated street price of USD549, and the Pro version will have a street price of USD799 with an availability of May. The industry reviews are beginning to show up on Exposure and it looks to be a hit. AlienSkin's plug-in helps the digital photographer bring back the look of specific film stocks and exposure characteristics. And their forum has started hosting several tutorials, such as this B&W conversion. Our congratulations go out to photographer Tony Sweet - he's been named a Nikon "Legend Behind The Lens" for March 2006. Tony is a well-established shooter, known for his fine art work. He was also our very first 'Podcast subject. Great job Tony! Here is your much awaited show report from The Image Doctors, "Live" from PMA 2006! Check back on March 16th for our regularly scheduled podcast. Download The Image Doctors at PMA: NPC-ID-2006-02-23.mp3 (18:20, 9.8 MB, mp3 format). Todays winner of a Markins M10 pro ball head at the Nikonians PMA booth is the photographer Arild Myhre out of Norway. Congratulations Arild and enjoy your new special edition, red colored Markins!